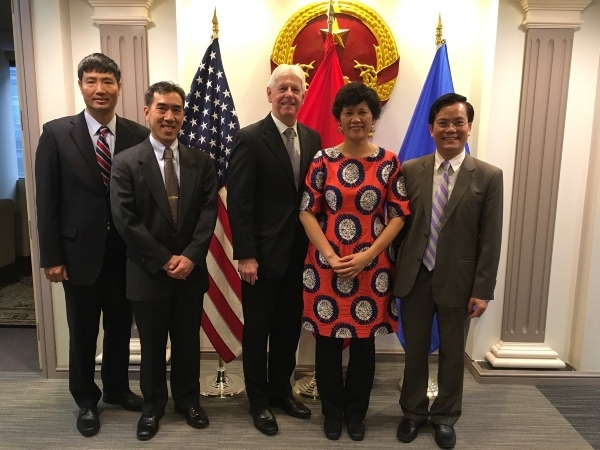 On January 24, Vietnam’s Ambassador Ha Kim Ngoc hosted IGE President John Boyd, Vice President of Global Operations James Chen, and Vietnam Program Manager Hien Vu at the Embassy of Vietnam in Washington, D.C.
Boyd shared with Ambassador Ngoc about IGE’s plans in March to hold its flagship Religion & Rule of Law certificate training program for local government officials and faith leaders in Qui Nhon, located in the south-central Vietnam. The training will cover international standards of religious freedom and legal protections of religious freedom in Vietnam. This year’s training will mark the 8th training of its kind held in Vietnam. The previous trainings were conducted in Hanoi (2012 and 2015), Ho Chi Minh City, Da Nang, Northwest Highlands, Central Highlands and the Mekong Delta region. Since 2012, over 550 Vietnamese government officials, faith leaders, policy advisors, and academics have participated in the training. Ambassador Ngoc recommended joint efforts between IGE and the Embassy to work on religion and diplomacy trainings. Ambassador Ngoc commended IGE for its constructive approach and impact in building religious freedom in Vietnam and encouraged IGE to continue its training programs for local government officials in Vietnam. He also thanked IGE for its positive contributions in fostering mutual understanding and reconciliation between Vietnam and the U.S.